India should put aside pride about its growing economy and concentrate on improving the lives of average citizens, argues Fortune's Cait Murphy. NEW YORK (Fortune) -- Plug in the words "India" and "superpower" into an Internet search engine and it's happy to oblige - with 1.3 million hits. I confess that I did not check each one, but I suspect that almost all of these entries date from the last couple of years. This is understandable. For the first time ever, India has posted four straight years of 8 percent growth; since it cracked open its economy in 1991, it has averaged growth of 6 percent a year - not in the same league as China, but twice the derisory "Hindu rate of growth" that had marked the first 45 years of independence. A homeless Indian mother feeds her child in Hyderabad. India has gone nuclear, and even gotten the United States to accept that status. Its movies are crossing over to become international hits. The recent $11.3 billion takeover of Corus by Mumbai-based Tata Steel was the biggest acquisition ever by an Indian firm. No wonder the idea of India as the next superpower is fast becoming conventional wisdom. "Our Time is Now," asserts The Times of India. And in an October survey by the Chicago Council on World Affairs, Indians said they saw their country as the second most influential in the world. Sorry: India is not a superpower, and in fact, that is probably the wrong ambition for it, anyway. Why? Let me answer in the form of some statistics. 47 percent of Indian children under the age of five are either malnourished or stunted. The adult literacy rate is 61 percent (behind Rwanda and barely ahead of Sudan). Even this is probably overstated, as people are deemed literate who can do little more than sign their name. Only 10 percent of the entire Indian labor force works in the formal economy; of these fewer than half are in the private sector. The enrollment of six-to-15-year-olds in school has actually declined in the last year. About 40 million children who are supposed to be in school are not. 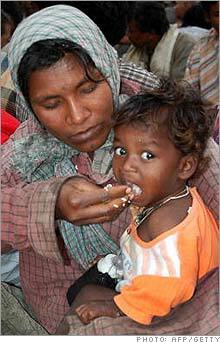 About a fifth of the population is chronically hungry; about half of the world's hungry live in India. More than a quarter of the India population lives on less than a dollar a day. India has more people with HIV than any other country. The 2006 UN Human Development Report, which ranks countries according to a variety of measures of human health and welfare, placed India 126th out of 177 countries. India was only a few places ahead of rival Pakistan (134th) and hapless Cambodia (129) and behind such not-about-to-be-superpowers as Equatorial Guinea (120), and Tajikistan (122). As these and other numbers suggest, Indian triumphalism (a notable 126,000 hits on Google) is not only premature, it is misguided. Yes, growth has been brisk, and of course growth is necessary to make a dent in poverty. But as Edward Luce, author of the excellent, "In Spite of the Gods: The Strange Rise of Modern India," noted in a recent talk, poverty in India is not falling nearly as fast as its brisk rate of growth might anticipate. The reason for this is that Indian growth has been capital-intensive, driven by the growth in high-value services such as IT. This is a good thing, but what it does not do is create stable and reasonably paid employment for not particularly skilled people - and this matters a lot, considering eight to 10 million Indians enter the labor force every year. Luce estimates that there are 7 million Indians working in the formal manufacturing sector in India - and 100 million in China. To look at it another way, the 1 million Indians working in IT account for less than one-half of one percent of the entire working population. This helps build reserves (and national confidence, and tax revenues) but is not the poverty buster that labor-intensive development is. As Prime Minister Singh told Luce, "Our biggest single problem is the lack of jobs for ordinary people." The problem with India's self-proclaimed (and wildly premature) declaration of superpower status is that it reflects a complacency about both its present - which for many people is dire - and its future. Eight percent growth for four years is wonderful, but as the saying goes, past performance is no guarantee of future results. And India is not doing what it needs to in order to sustain this momentum. Consider the postwar history of East and Southeast Asia. The comparison is appropriate because India started at about the same point, and has watched just about every country in the region get ahead of it on the economic curve. All these places developed by being relatively open to trade; by investing in primary and secondary education; and by building pretty decent infrastructure (not only roads and ports, but health clinics and water supplies). India has begun to embrace one leg of this triangle - freer trade. Even here, though, many of the worst features of the swadeshi ("self-reliance") era remain intact, including an unreformed state banking sector; labor regulations that actively discourage hiring; abstruse land laws (and consequent lack of land titles); misshapen subsidies that hurt the poor; and corruption that is broad, deep and ubiquitous. Nothing useful is being done about any of this. As for the other two legs of this development triangle - education and infrastructure - these are still badly broken. About a third of teachers fail to show up on any given day (and, of course, are unsackable); the supply of both water and power is expensive and unreliable. These facts of life too often go unremarked in the current euphoria about the state of the nation. "We no longer discuss the future of India," Commerce Minister Kamal Nath told the Financial Times in a typical comment. "The future is India." Hubris, of course, is the stuff of politics everywhere. But the future will not belong to India unless it takes action to embrace it, and that means more than high-profile vanity projects like putting a man on the moon or building the world�s tallest tower. It means showing that the world's largest democracy can deliver real progress to the hundreds of millions who have never used the phone, much less the Internet. And in important ways, that just isn't happening. India has many reasons to be proud, but considering it remains a world leader in hunger, stunting and HIV, its waxing self-satisfaction seems sadly beside the point.